The developers of Miami Worldcenter, recently re-imagined as a “High Street” retail concept similar to Lincoln Road, may be looking to fill their project with shopping giants like Zara, H&M and Victoria’s Secret that are at their other malls. 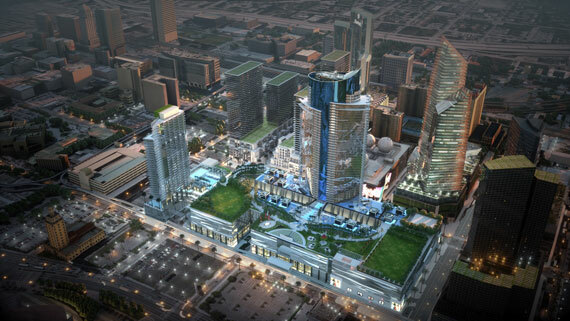 The news was discussed at a Paramount Miami Worldcenter sales team meeting Thursday night. Nate Forbes, president of the Forbes Co. that’s handling leasing alongside Taubman Partners, met with a group of agents to shed light on the project’s future. According to Worldcenter spokesperson Tadd Schwartz, Forbes said the group is in talks with a number of big-name retailers that are tenants at their other U.S. malls. “Nate Forbes came to Paramount to give the brokers an update, and in doing so, spoke about the types of tenants that Forbes & Taubman deal with all over the country,” Schwartz told The Real Deal. He declined to discuss specifics. However, broker Michael Light wrote in a blog post that names like Zara, Victoria’s Secret and H&M have been mentioned. Dan Kodsi, developer of Paramount Miami Worldcenter told TRD that the group is aiming for a mix of luxury and “high traffic” retailers. The Forbes Co. owns such malls as the Mall at Millenia in Orlando, the Gardens Mall in Palm Beach Gardens, and Waterside Shops in Naples, where stores include everything from Jimmy Choo, Gucci and Chanel to Forever 21, Urban Outfitters, J. Crew and Banana Republic. Miami Worldcenter was originally planned to be developed as a 760,000-square-foot mall anchored by Macy’s and Bloomingdale’s. But on the eve of Worldcenter’s groundbreaking, the developers announced that they had scrapped the project’s original design. Instead, they plan to build a “High Street Retail” concept totaling 300,000 square feet with a new mix of tenants. More details about the new concept are yet to be released.